Textile and dye industries’ wastewaters are one of the major problem in the water pollution. This wastewater causes serious environmental pollution, because of non-biodegradable and toxic dye molecules. Azo dyes are widely used in the textile industry. In the anaerobic condition azo dyestuff decompose to toxic byproducts. The aim of this work is to understand the adsorption mechanisms of various azo dyestuff adsorbed by domestic wastewater treatment plant inactivated sludge. To determine the adsorption mechanisms, various isotherms and kinetics were used and constants of each isotherms and kinetics were calculated for each dyestuff. In this study, Reactive Black 5 (RB5), Reactive Blue 21 (RB21), Acid Brown 283 (AB283) and Basic Violete 3 (BV3) azo dyestuff adsorption data were used for isotherms and kinetics calculations. The results of this study showed that, the best isotherm which describe the adsorption process was Freundlich. This isotherm model assumes that heterogeneous sorption occurs on adsorbent surface, stated in other words adsorption power varies at every sorption point. For RB5 and AB283 dyes, the best kinetic model which describe the adsorption process was pseudo-second-order kinetic model. This kinetic model assumes that adsorption rate dependent to adsorbent material quantities and contact time. .W. Lee, S.P. Choi, R. Thiruvenkatachari, W.G. Shim, H. Moon, “Evaluation of the performance of adsorption and coagulation processes for the maximum removal of reactive dyes,” Dyes Pigments, 69 (2006) 196–203.
.	A.B. dos Santos, F.J. Cervantes, J.B. van Lier, “Review Paper on Current Technologies for Decolourisation of Textile Wastewaters: Perspectives for Anaerobic Biotechnology,” Bioresource Technology, 98 (2007) 2369-2385.
.	A.A. Attia, B.S. Girgis, N.A. Fathy, “Removal Of Methylene Blue Bycarbons Derived From Peach Stones By H3PO4 Activation: Batch And Columnstudies,” Dyes And Pigments, (2008) 282-289.
.	M.A.M. Salleh, D.K. Mahmoud, W.A. Karim, A. Idris, “Cationic and anionic dye adsorption by agricultural solid wastes: A Comprehensive review,” Desalination, 280 (2011) 1-13.
.	A. Stolz, “Basic and applied aspects in the microbial degradation of azo dyes,” Appl. Microbiol. Biotechnol. 56 (2001) 69–80. ISNAD ISIK, Onur . "Isotherm and Kinetic Modelling of Azo Dyes Adsorption". 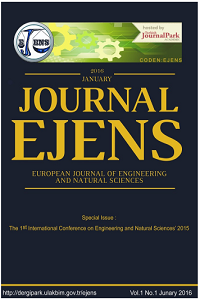 European Journal of Engineering and Natural Sciences 2 / 1 (February 2017): 210-216.